Mode: Exam will be conducted in Offline mode. Type of Questions: Multiple Choice Objective Questions will be asked. Qualifying Marks: Qualifying marks for written exam will be 45% for Unreserved category, 40% for OBC category, 35% for SC/ST and 30% for PwD Category. Candidates who clear the Written examination will have to attend Interview, which be of 50 marks. List of final selected candidates will be made on Written exam and Interview (total 250 marks). Negative marking: 0.25 marks will be deducted for every wrong answer. Negative Marking: For each wrong answers, 0.25 marks will be deducted. The ESIC committee will decide the candidates qualifying for the next round depending on the examination marks. The candidates who qualify in both the papers of the written exam he/she shall be called for the interview. Computer Skill Test: 30% Weightage respectively. 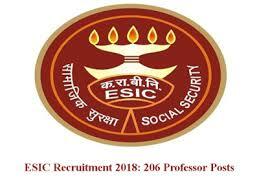 ESIC declares notification for recruitment in all regions. The scheme of exam and selection process are given elaborately in the notification. We have mentioned details about selection for each post below here. Part-I: Written test for which qualifying marks is 33% for UR candidates and 30% for SC/ST/ OBC/ PWD/ EXSM candidates. Part-II: Stenography test, for which qualifying marks are passing marks decided by ESIC. Part III: Computer skill test or objective test to assess working knowledge of computers, for which qualifying marks is 17 out of 50 for all candidates. Upper Division Clerk (UDC): Part I – Written test, for which qualifying marks is 40% for UR candidates and 35% for reserved category candidates. Part II: Computer skill test or objective test to assess working knowledge of computers, for which qualifying marks is 17 out of 50 for all candidates. Multi Tasking Staff (MTS): Written test, for which qualifying marks is 40% for UR candidates and 35% for reserved category candidates. ESIC MTS Result 2016 of written examination indicates the candidates who have cleared cut-offs of the exam and provisionally selected for recruitment.